No. 20, Lorong Sungai Puloh 7/KU6, Kawasan Perindustrian Sungai Puloh, 42100 Klang, Selangor, Malaysia. Company Profile Synstech Sdn Bhd is a well-diversified company involved in complete storage system for commercial and industrial, engineering services. 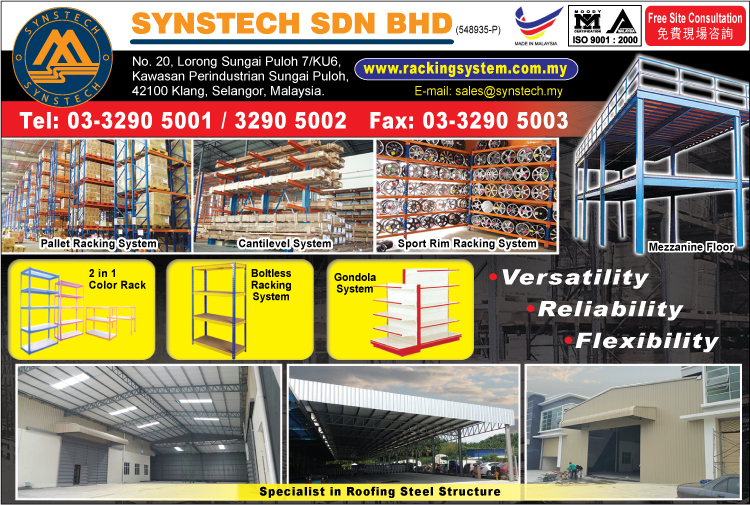 Established since 2000 as trading company, Synstech Sdn Bhd has since grow from a small trading company into a reputable Total Storage Solution provider and Steel Structure Engineering company. Our Mission is to provide our clients with superior quality, safe work, performance, competitive pricing and solutions to all our clients. Our Quality Statement is to provide highest quality of work and development solution and services that will put our clients business on the cutting edge all over the world and to enhance their satisfaction by continual improvement of our establishment. High quality, timely deliver and satisfied customers have been the key to our success.